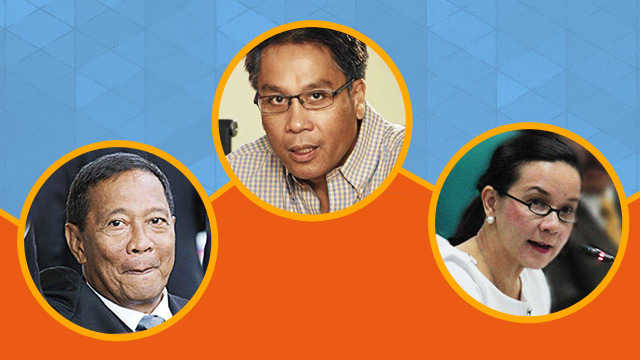 Vice President Jejomar Binay, administration bet Mar Roxas, and neophyte senator Grace Poe are "statistically tied" in the new survey conducted by the Social Weather Stations. The poll, published by Business World, was conducted on September 2 to 5 among 1,200 participants all over the country. Of those polled, 96 percent were registered voters. The participants were given a list of 12 names in alphabetical order, with nicknames included, and were asked: "Among the names found in this list, who will you probably vote for as a president of the Philippines if elections were held today?" Results show that Poe topped the survey with 26 percent votes followed by Binay with 24 percent and Roxas with 20 percent. Davao City Mayor Rodrigo Duterte came in fourth with a rating of 11 percent followed by senators Chiz Escudero and Bongbong Marcos Jr. with four percent each. Two percent of the respondents say they are still undecided. Meanwhile, the survey also asked the public to name their preferred Vice President. Poe also took the lead, followed by Escudero. This survey is the second poll released by SWS this week. The first one involved asking participants to name three persons who they want to run the country. Poe also led the said poll with 47 percent.